Starglazer Lily full view, originally uploaded by DianthusMoon. My Starglazer lily finally opened up over the last few days. I was wondering if it could stand the heat as it’s in a pot, but it looks good, only a few buds wilted. And you know the smell of this flower is amazing too. I’d love to have an entire field of them to frolic in! We are expecting glorious, soaking rain on Saturday. Hooray! I hope it does rain. It rained about 5 miles from here where Sean works today and we got nothing. 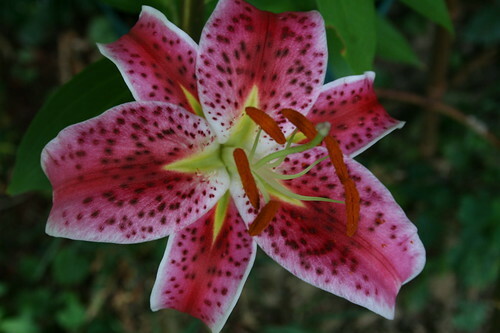 Love stargazers. Easily my favorite flower. That is a beautiful lily. I’m enjoying all the old-fashioned orange ones around the neighborhood, though they do not seem to have a scent.